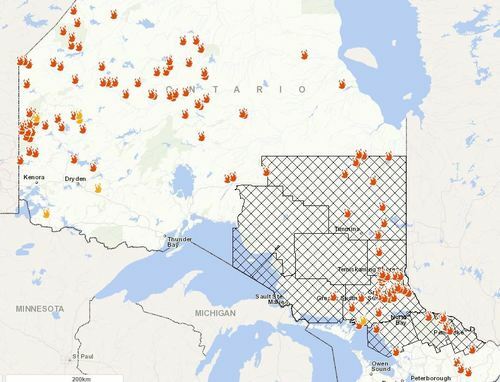 Take a look at some of the big active fires right now compare to the infamous Timmins 9 fire of 2012. Shayne McCool, one of the ministry of natural resources' fire information officers, was just on CBC Radio's Ontario Morning talking to guest host Althia Raj. He gave an update on the situation in northeast Ontario. There are 55 active fires in the area. 21 of them are not under control. 24 are being held, under observation or are under control. If you've been following along, you know that's a smaller amount of fires than the area had Monday, when there were 60. There are some concerns though as dry lightning is in the forecast. That's lightning without rain. McCool attributes dry lightning with the big spike in forest fires this year over last. By this point last year, there had been 190 fires. This year, there's been more than 800. When there is lightning without rain, “it doesn’t tend to cool the forest down," he said. Northern Ontario is large. While much of the focus has been on the big fire near Parry Sound, there's also fires burning in northwest Ontario. We told you about the five new fires in that area a bit early, around Red Lake, Fort Frances and Dryden. There's a total of 77 fires are burning in the northwest, with 65 of them under observation, being held, or under control. The big fire to keep an eye on is Kenora 71. The ministry said that fire did receive some rain, which has reduced fire behaviour. It still measures 10,887 hectares in size and is not under control. A restricted fire zone now extends to include the communities of Caramat, Manitouwadge, Hornepayne and Hillsport. There are six of them, according to the ministry. Five are in northwest Ontario. Three are in the Red Lake area, one is near Fort Frances and the largest (0.6 hectares) is outside of Dryden. They are all caused by lightning. 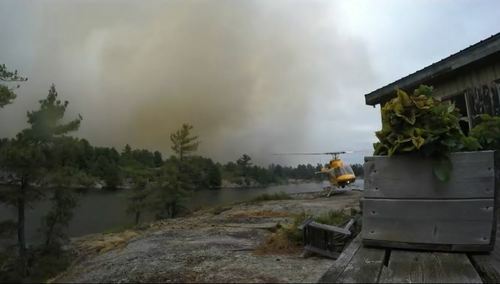 The other new fire is south of Sudbury, inside Killarney Provincial Park. It's small but under control. The cause is unlisted. 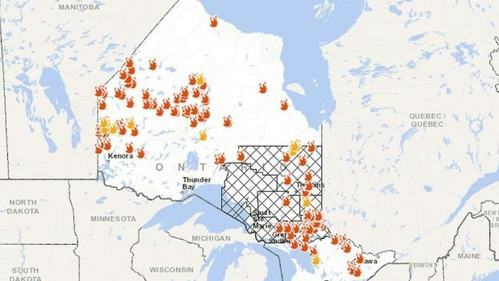 Dozens of forest fires continue to burn in northeast and northwest Ontario. We'll be tracking the latest updates here throughout the day. Here's a look at the current situation, according to the ministry of natural resources. The orange flames represent active fires (some are out of control, others are holding or being watched) while the yellow flames represent new fires. The cause of Parry Sound 33? 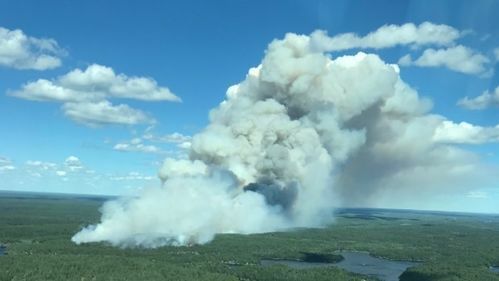 That's the name provincial officials have given the big fire that started on Henvey Inlet First Nation, just north of Grundy Lake Provincial Park. And there has been lots of speculation about how it was started. Workers on one of the province's largest wind projects allege the forest fire was sparked by construction on the wind farm during an extreme fire ban. The Ministry of Natural Resources and Forestry is investigating the claim. In the meantime, it's the subject of CBC's own investigation piece, written by Dave Seglins. The areas under fire ban have been extended thanks to little rain and dry conditions. Here is the current fire ban map, according to the ministry. McCool was also able to give an update on the big fire in the Parry Sound area. The size was unclear yesterday. He said it has grown to 5,612 hectares and remains out of control. The cause is also being speculated. While it was listed as human made, that's been removed and is now under investigation by the ministry. In some cases, the cloud cover and smoke has made it hard to get a sense at just how big or small these fires are. Doug Clark has been documenting the fire via video and photos, sharing updates with the Key River Area Association, a Facebook group of one of the impacted communities. He put together a short video showing what one of the fires looked like as it was approaching over the weekend via time lapse. You can also see how crews are responding, via helicopter and water bomber. 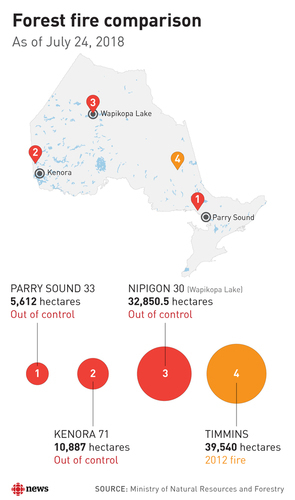 While lots of attention has been paid on the size of Kenora 71 (now 10,887 hectares) and Parry Sound 33 (5,612 hectares), they aren't nearly the largest of the active fires. That title belongs to Nipigon 30, a remote fire on Wapikopa Lake near Winisk River Provincial Park. It measures 32,850.5 hectares in size and is out of control. The fire started earlier this month on July 9. To put that in perspective, the big Timmins 9 fire of 2012 burned for five months, measuring 39,540 hectares. Notable: "A total of 77 fires are currently burning across the region, with 65 of them classified as under observation, being held or under control." 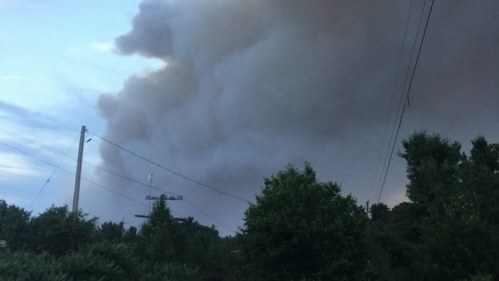 Five new forest fires have sparked as of Monday night in the northwest region according to the Ministry of Natural Resources and Forestry. The CBC's Chris Ensing is on the road, covering the fires south of Sudbury. 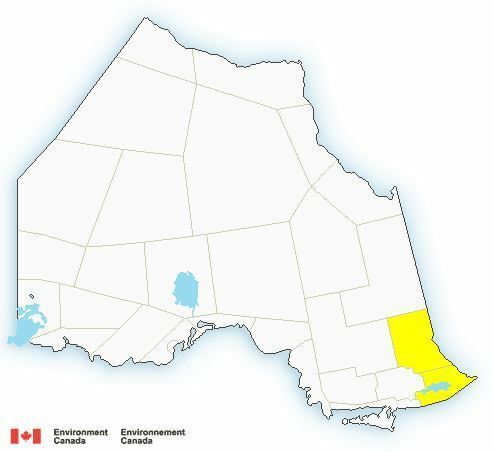 We told you about it earlier but we've got some more information now: the restricted fire zone now extends south of the French and Mattawa Rivers and includes areas as far south as Rosseau. That also includes the southern tip of Algonquin Park, east to Renfrew. Failure to comply could result in fines of up to $25,000 and three months in jail for the offender, as well as shouldering the costs incurred in fighting a forest fire. 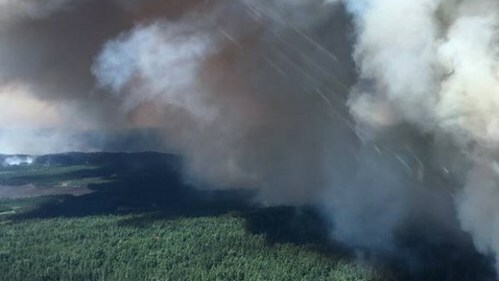 The Ministry of Natural Resources and Forestry has updated the restricted fire zone to include popular camping areas in northern Ontario, despite an evening of steady rain in the area. The provincial park has closed canoe routes because of the forest fires and "significant smoke activity." They've also closed thirty lakes to back country paddlers. You can get the full list here. They are recommending anyone who has an outpost camp on one of the lakes not access them -- though they are not restricted. One of these outpost camps has been evacuated as of Tuesday morning. There's a "nice gentle rain" there right now, according to a post on the Key River Area Association Facebook page. Several others are commenting, adding that it is raining where they are too. They just don't want lightning, which has caused many of the forest fires. And speaking of lightning ... 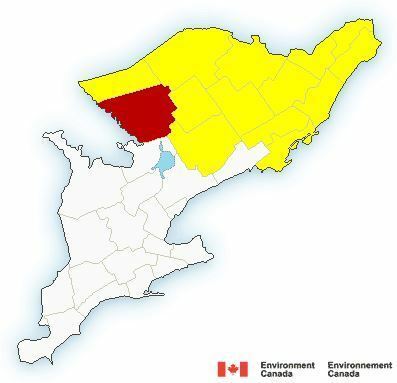 Environment Canada has issued a series of thunderstorm watches for some of the areas with forest fires. While the storms may come with rain, lightning is not welcome. Conditions are favourable for thunderstorms this afternoon and into the evening. The watches are for the town of Parry Sound — Rosseau — Killbear Park, South River — Burk's Falls, Bayfield Inlet — Dunchurch, New Liskeard — Temagami, North Bay — Powassan — Mattawa and West Nipissing — French River. We're hearing about weather from some of our readers, viewers and listeners. Twitter user Terence Graham got rain along the St. Mary's River, by Sault Ste. Marie, for the first time in weeks. 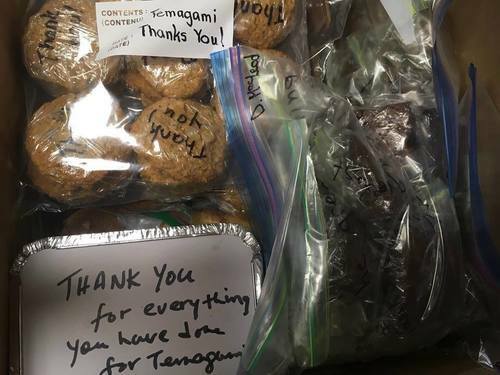 Over in Temagami, where rescue crews are battling a cluster of fires, members from the community decided to get together to bake a special thank you for the first responders. Each baked good had its own personal thank you note. 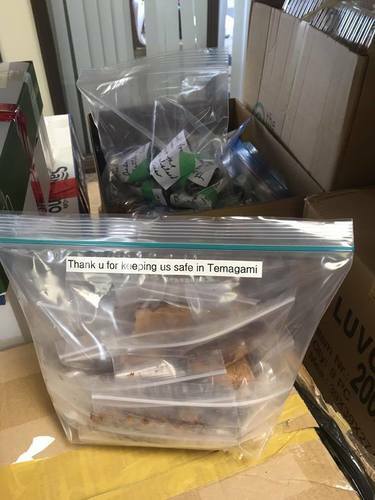 "Thank you for everything you have done for Temagami," read one container. The goods were delivered to the base camp at the old Sherman Mine. That's how much space the fires in the northeast are covering. Take a look at how it has changed since July 8. Several meteorologists south of the border are tweeting about the smoke from these forest fires, which has drifted down and is making some U.S. skies hazy and smoky. The smoke has been spotted in Chicago. Anywhere else you can see or smell it American friends? 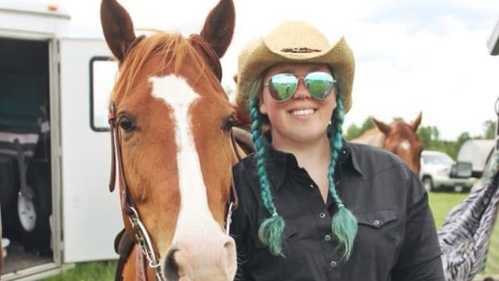 Farmers and ranchers in the French River and Parry Sound areas have found some support in their friends to the north. CBCPeople aren’t the only ones feeling the heat from northern Ontario forest fires.